With the Iraq War having officially ended this month, I want to reflect on the concept of "just" war. Many of us have an elementary criteria that we apply in determining whether a war is justified or not. But what do we mean when we say that a particular war is "just" or "unjust"? Under what conditions would an act of war be justified? And if we could agree upon a set of standards to justify an act of war, then when applied down to a micro level of individual physical violence and aggression between people, with some exceptions it should be more or less the same. Self defense is the most commonly agreed upon legitimate motive for a justified act of violence toward another person or persons. That is to say, one has the right to defend themselves against another person's physical aggression, and therefore the injuries incurred to the aggressor are justifiably so. And, if this is true for individuals, the same more or less applies to nations. With retaliation things get a bit more complicated. Some agree that once one has been the victim of an act of violence or aggression that they could not stop, one then has the right to then retaliate against their attackers. If you agree with this, then revenge could be a "just" cause for violent retribution. And once again, if inflated to the macro level, nations and societies might be justified in their acts of retaliation against their victimizers. Others do not agree, and maintain that only self defensive violence can be reasonably just. This brings us to to the idea of preemptive acts of violence or war. The invasion of Iraq by the United States and its allies in 2003, was a preemptive strike against a rouge totalitarian State, in order to prevent it from being a more imminent, immediate and formidable threat later on. For some, preemptive foreign policy is never justified, and in the case of the Iraq War the supposed reasons for the preemptive strike in the first place, were either fabricated intentionally or the result of embarrassingly bad intelligence. What's an Atheist to do Around the Holiday Season? Christmas is here already. I've been so busy with work and other things that I haven't had time to get into the holiday spirit. I don't really get into the holiday spirit anyway, I'm an atheist. Christmas today, at least in America, is all about mass consumption of goods. That is to say, spending money you don't have, to buy things you don't need, for people you don't like, so that you can get deeper into debt, and so the credit card companies can charge you interest, and profit off of your "holiday spirit". That's how I see Christmas anyway, and I do not wish to take part in this festival of floating capital. Christmas isn't really a Christian holiday anyway. The Roman empire combined their pagan holidays in the end of December when it was adopting Christianity. It was the winter solstice they celebrated, and the birth of pagan gods like Mithra. Scandinavian pagan traditions were included, such as the tree lighting, and Santa Claus, a 19th Century American creation, added secular chapters to the holiday. The birth of Jesus' significance seems to fade away with each passing year. It is Christmas' reincarnation into a celebration of material consumption that I most have a problem with. I am well aware of its importance in the business world and in truth, many of us benefit financially directly or indirectly because of this. But still, I do not take part for reasons of principal. I don't often debate religion with fundamentalists, but when I get the rare opportunity it is often exhilarating. This made me think recently of the notion of an "intellectual enemy". That is to say, someone who holds beliefs that if they became the law of the land, the very air would be difficult for me to breathe. I wouldn't be able to exist as I am naturally. An easy example of this would be having to live under an Islamist state or a theocracy. Another would be living under a Stalinist-style dictatorship. The people then who espouse these religions or ideologies and who are actively trying to spread them, are what I call my intellectual enemies. Now I regard intellectual enemies a bit distinguished from other traditional enemies. I do not necessarily wish harm on those who think differently from me. When I wrote The Infidel's Guide to Islam I carefully mentioned in the introduction that I did not advocate any violence or harm towards Muslims in any way. Instead, I wrote that debate and argumentation should be the weapons of choice. This is a ideological battle that is ensuing, not a real war. Now that doesn't mean that our war on "terror" isn't a real war against radical fundamentalist Islam, with casualties mounting on both sides. What I mean is that we simply cannot kill our way to destroying Islamists and theocrats; the war must inevitably be won with argumentation and persuasion. Lovers of freedom and secularism must win the opinion war against those who assert that a politicized and literalist interpretation of religion be forced on the masses. So I'll take a moderate Muslim over a fundamentalist any day. I'll take a cafeteria Christian over a fundamentalist any day as well. I'd take a secular humanist over all of them, although I wouldn't necessarily judge a person solely by their religious beliefs. Doing battle with words can often lead to real life physical violence. I am aware of that and weary, especially when one criticizes Islam, that people can get killed. I acknowledge this reality, while seeing Islam as the most formidable contemporary enemy to the secular way of life that I relish in. What I fear about Islam is its spread in the West. I hate the idea that ever increasing numbers of subversive Muslims are populating the West, with the overall goal of one day victoriously raising the flag of Allah and enforcing Sharia law. You may call me an Islamophobe if you are a liberal sympathizer, but there is credible evidence that this is the objective to a surprising number of Muslims, and it's not just a tiny fringe minority. Just as Communism and Fascism was defeated, I hope too that one day radical Islam will retreat into the darkest corners of the minds of a few ineffectual people. I would like for Muslims to embrace a secular political system as we have here in the U.S., to adopt modern secular humanist values as most progressive Christians and Jews have, and for them to detach themselves from the superstitious thinking produced by faith. If these first steps can be made, I think here in the West we can coexist without much conflict. If an evolution of sorts like this is not made in the Islamic world, and Muslims remain in isolation among us in the West, making no attempt at assimilation, then we will never reconcile our differences and remain intellectual enemies. Modernity must force the Muslim to open their eyes with the shine of enlightenment exposing the truth. If they refuse to acknowledge what they see and wish to remain blind, then there is no hope for our two civilizations and therefore little hope for humanity's future. I got a text from a friend at work today for Christopher Hitchens to rest in peace. I immediately Googled his name on my phone to see that Hitchens had indeed passed on, succumbing to the effects of his esophageal cancer. Christopher Hitchens was my intellectual hero, my idol, someone I wanted to emulate, and an inspiration who changed my life in a new direction. His wit, knowledge, propensity for clever argumentation, and his strong opinionated stances characterize why I think he was the most interesting intellectual of our times. He was a fervent atheist, whose arguments strengthened my disbelief and provided the rock solid foundation for it to build on. I would Google him and search for him on YouTube almost daily, eagerly waiting for the next clip of him debating an opponent or speaking on one of the many topics he so deeply understood. His articulateness, combined with his British accent, flowed out of his mouth like poetry. I would hang onto his every word, repeatedly watching over and over again. 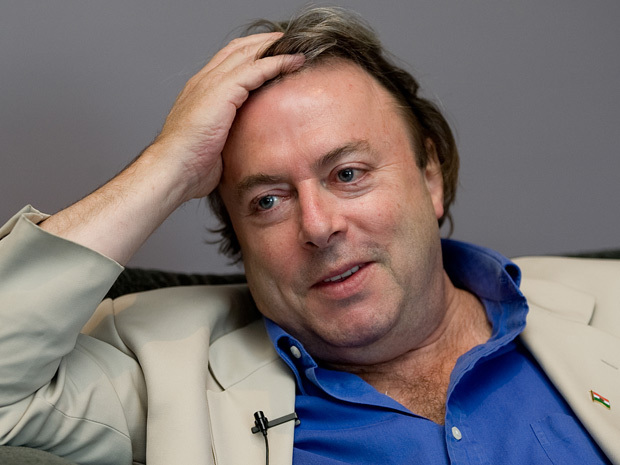 It was sometime around 2009 when I saw Hitchens on a YouTube video debating religion, that he caught my eye. I loved his style, his audacity, his skills as polemicist, and his ability to so easily expose the most ridiculous and contradictory aspects of religion and the faithful. I was instantly hooked. I bought his best seller God Is Not Great, and devoured it while on vacation in Asia after I graduated college. Getting into Hitchens so late in his life is a bit disappointing considering his early death. I didn't have the time to enjoy him for decades as others have. His works however, both written and oral, are immortalized and can be enjoyed forever. His legacy will live on the spirit of those he touched and for those like me who will continue his argument against the wretched effects that religion and faith produces. Hitchens was a hard-lined drinker and smoker, a lifestyle that I have embraced more often then not in my adult years. As I glance toward the pack of cigarettes on my coffee table contemplating another smoke while writing this blog, I wonder whether I too will meet such a fate. Burning the candle at both ends, as Hitchens puts it, make one shine brighter, but makes one a candidate for an early visit by the grim reaper. I've always made attempts to do everything in modesty, for the obvious reasons. I've always been a recreational user of any substance. Cigarettes however, pose the biggest challenge to moderation. It's such a subtle and situational addiction. Even Malcolm X famously compared the relative ease at quitting heroine to quitting cigarettes. I bought a bottle of Johnnie Walker Black Label, his favorite scotch whiskey of choice, as a tribute celebrate his life and death. I had planned this months ago knowing that the end for Hitchens was nearing. I was clinging on to the hope that he would be a rare exception and beat his cancer, while acknowledging that the odds were not favorable. I had dreams of him dying and how I would feel upon the news. It never is quite as you imagine it to be when it really happens. I have rarely experienced death in my short life. Perhaps I am lucky. I do gleefully rejoice in the opportunity to having had briefly met Hitchens after one of his debates here in New York. I remember making him laugh with a slight joke about having the King James version of his book. It was a great moment, in my life anyways. While walking home from work, depressed, thinking of Hitchens' death, and staring at the sea of anonymous faces during the rush hour commute, I had this strange thought that it would be better to be dead now with Hitchens dead too. Realizing this macabre prospect, I mentally raced back to rationality, with the knowledge that life goes on, and that it is worth living for. Usually. This drink is for you Hitch. The essence and implications of politeness. Think about it for a moment. It's no secret why politeness is socially advantageous: Social creatures must deal with each other. But I’ve often wondered how polite I come off to people who I encounter. Well sure it would matter what situation I was in at the time. It would depend on whether I was working, whether I was in a social group, whether I was inebriated. I've been told that I can come off as quite a bit arrogant. I know for example that I often do not go out of my way to be accommodating, and I usually want to just keep to myself in my own little bubble when in public. And I can see how that can sometimes come off as arrogant. Not acknowledging someone can seem rude, not smiling or laughing at others and initiating small talk when it seems appropriate can sometimes seem cold. As someone passionate about philosophy, the contemplation of politeness makes me think about ethical egoism. Ethical egoism is a philosophy constructed around the idea that it is best to consider your own benefits, both in the short and long term when making moral decisions. Under ethical egoism, politeness and generosity are good behaviors because in the long term, it will eventually come back to you, and you will benefit from it. To be selfish can be socially disadvantageous, and therefore selfishness is not in your best interests. We all practice ethical egoism in our daily lives whether we know it or not. Now it is true that it has its critics, who espouse that every act of supposed altruism by the ethical egoist, is really done out of selfishness, and benefiting their own well being. This makes me wonder about how we view politeness: Do we act polite only because we think we will ultimately benefit from it? When I reflect on politeness, I think of how much I like a polite society, but I also think of how I may not fit into a really polite society, in light of my unaccommodating nature. I also know that feeling of elitism I sometimes get within a certain crowd, that feeling like the air I breathe is more sophisticated, and deriding things that are below me. I know how much I hate it when that is done to me by others. This sounds like a great occasion to apply the golden rule, in theory and in practice. A great piece of wisdom when applied strategically, can eradicate years of ignorant folly. If I adhere to the golden rule in principle (while acknowledging it is not perfect), mustn't I adhere to it, in practice? What is the difference between the agnostic vs. the atheist? First of all let's be clear about one thing: No human being can prove or disprove, with empirical evidence, and absolute certainty, that god does or does not exist. There is no smoking gun, no piece of evidence, tangible or not, that anyone can present to another, and say "Ah-ha! This proves I'm right!". That being said, every argument for and against the existence of god, is an argument of probability. That is to say, given the amount of knowledge and evidence that exists, what is most probable, what is most likely truth, that god exists or that god does not. Now the agnostic looks at the evidence for and against god, and comes to the conclusion that none of it is compelling in either direction. He basically sits on the fence saying that the evidence is about equal and could go either way. Or, in the absence of proof, he says the truth cannot be known, and therefore remains ambivalent. Some argue that agnosticism is the rational position to hold. However, we would all then have to be an agnostic on everything that we didn't have absolute proof on, and we would never ever be able able to take a position. The atheist sees the evidence, and concludes that it is overwhelmingly more probable that god does not exist. The atheist does not have to prove empirically that god does not exist to hold his position, no more than the theist has to prove that god does exist, to maintain his position. They each see the evidence as being skewed towards their position.